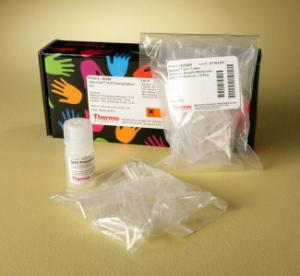 SDS-Out™ SDS Precipitation Kit provides convenient removal of SDS from small-volume (0.1 to 10 mL) protein samples. It has been tested with BSA, cytochrome c, soybean trypsin inhibitor, ovalbumin, ribonuclease A, myoglobin, and human IgG. Delivery information: The kit includes SDS Precipitation reagent (10 mL), spin cup columns (12 columns) and collection tubes (12 tubes).